This is the Janam Kundli chart finder for all years. You can find any chart from the year 1930 – 2015 and even farther into the future. You can get Janam Kundli charts up to the year 2035 with this free calculator. This horoscope is based on your birthday, your place of birth, and the time of your birth. Our entire lives are ruled by the stars and planets in the sky. 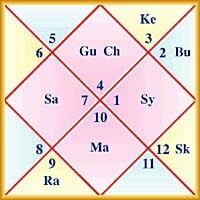 The Janam Kundli is a chart that is a beautiful picture of the sky at the time of your birth. This chart you will show you the placement of the planets in your houses and the different signs that they occupy. You can have a good luck at how your areas of life are being influenced. At a glance, you can predict what type of energy is in you places of love, wealth, career, health, self, friendships, enemies, marriage, and more. Your natal chart will show you the sign of your Rashi, and Lagna; two very important facets of a natal horoscope. There are also malefic and benefic planets that you will be given the data of in order to further be able to predict your life events in terms of luck and even hard work. There are lots of calculations that are taken into account to get your correct star signs and create a picture of your horoscope that can be analyzed. With a horoscope such as this, you can look at your life in s different perspective and be able to see your problems and success before they even come into existence. Being prepared for new life events is an extraordinary way to create the life that you want and a way to avoid things that have chances of happening if you see them as beneficial. Your chart might look like a work of art to you. So feel free to print it out and frame it. Put it on your wall where you will see it every day to that you can remind yourself of who you have been, who you are, and who you aspire to be.